When we heard that the decade old, Out of the blue, Bandra is changing management, we were both nervous and excited. The interiors of the place are changed completely, so has the menu. From a cozy, romantic diner, Out of the blue is now a casual, brightly lit restaurant. A wine cellar on one side and tables spread throughout the outside section, dare we say that the canopy style seating was highly missed. The menu had sizzlers but they were not available and we hear that they will no longer be available at Out Of The Blue (noooo!). We decided to try out some of the new starters, the Bravia Potatoes topped with smoked sofrito and garlic saffron aioli and the Asian Spring Veggies Bao with sesame seeds, crushed peanuts and lettuce. The Bravia Potatoes were good, we loved the saffron aioli that they were topped with. The Bao however, was bland and no dipping sauce was served with it. For mains, since sizzlers were not available, we settled for the pizzas and pastas. We tried the Bianco and the Harissa Roasted Pulled Chicken Pizza. No choice of crusts were offered, again, a disappointment. Taste wise, both the pizzas were quite average.The pastas on the contrary were spectacular. The Gnocchi, the Aglio Olio and the Arrabiata Spaghetti. Coming to the desserts, we tried the Baked Philly Cheesecake and the Kahlua and Baileys Mousse. Again, the desserts were great, cheesecake was smooth, consistent and not grainy. The mousse had a strong flavour of Baileys and that’s why we loved it. Overall, this new face of Out Of The Blue had some hits and some misses. With a little bit of polishing, we think they might be able to shine as bright as the old one. P.S. Please bring back the sizzlers or we will be heartbroken! The only thing that can beat this torturous Mumbai heat is ice cream! 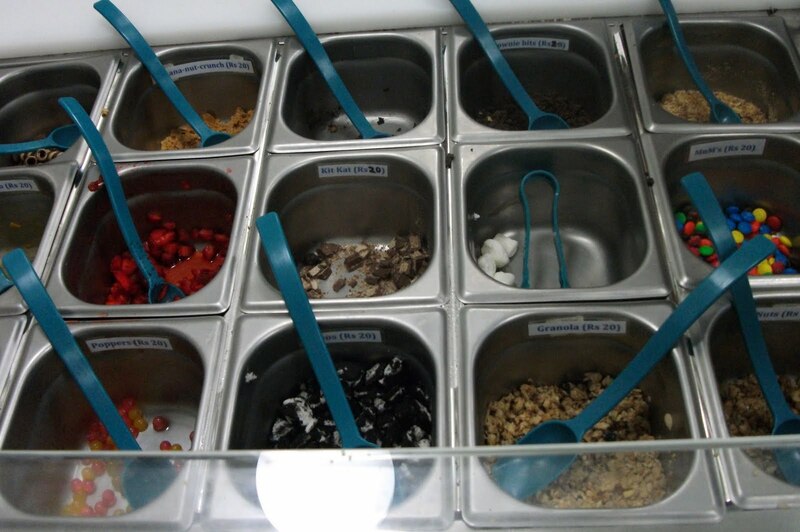 And imagine a place that let’s you mix and match your favorite flavors and top them up with some delicious toppings. 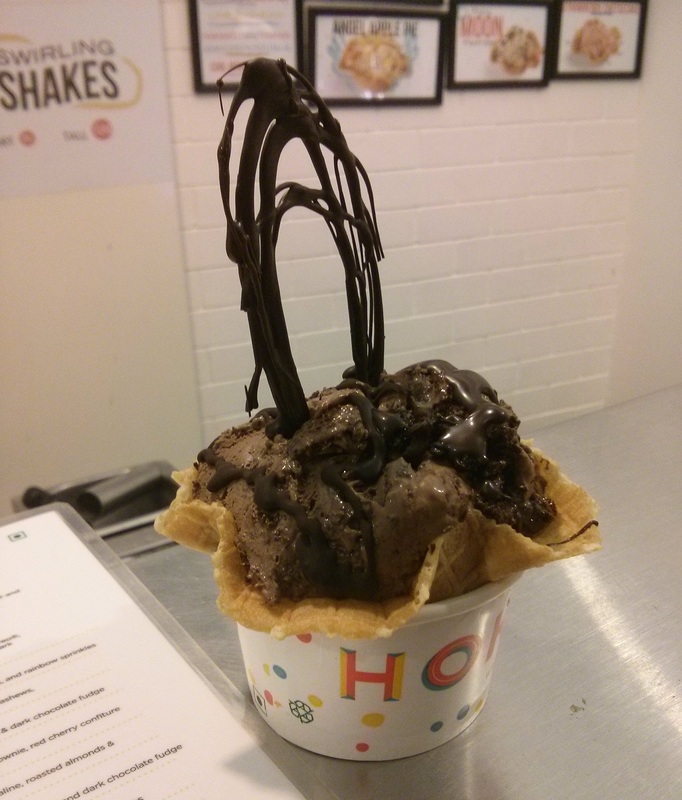 Hokey Pokey, that’s been around for a while now, is definitely on the list of our favorite ice cream parlours. Well, a fun event that ended with us gorging on too much ice cream, but we’re not complaining. There’s a reason why we love Bandra so much! There’s never a dearth of new places to visit. 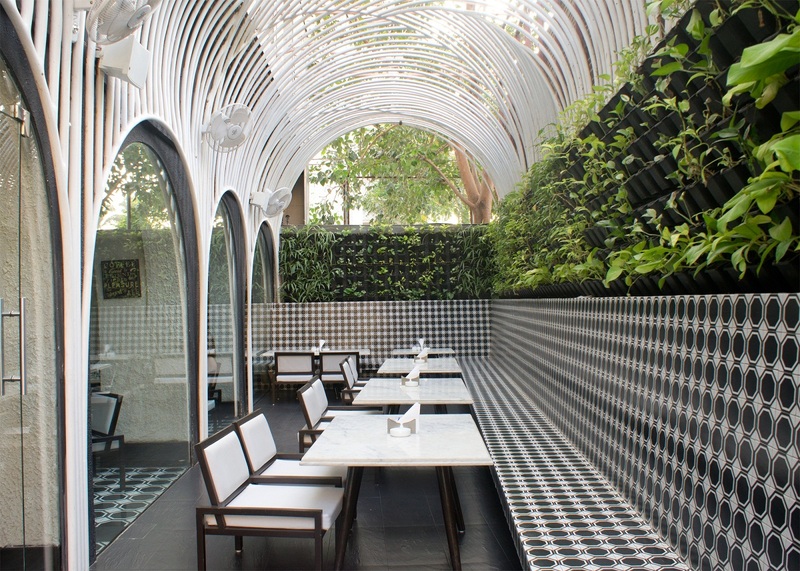 Polpo Cafe & Bar is an extension of the classic upscale family restaurant Shatranj Napoli. 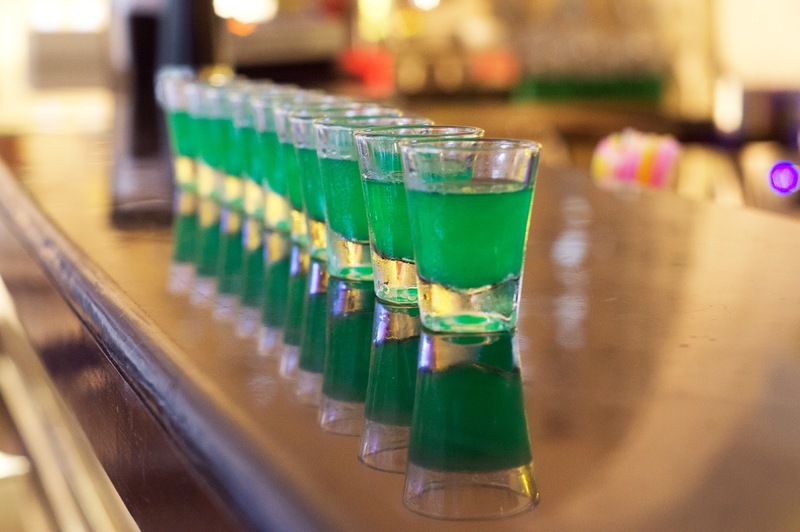 It is aimed at the younger crowds with a gorgeous al fresco cafe and an indoor bar. The all day dining place has multiple menus, cafe menu, bar menu and the shatranj food menu. 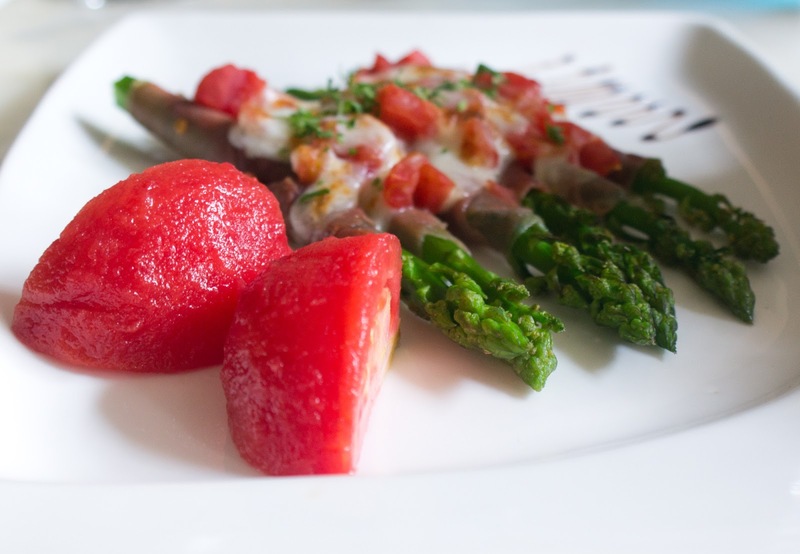 We visited with a group of bloggers and tried a range of dishes. Let’s talk about the ones we’d recommend! To start with, their Sangrias are one of the best that we’ve had. The blonde sangria, sparkling sangria and the red sangria, all of them were fruity and flavourful. A fellow blogger, Prachi absolutely loved the Limoncello! Read her review here. Next, we called for the starters. Some of the dishes we loved were the Asparagi al Prosciutto – asparagus wrapped with Parma ham, absolutely delicious, Pollo della Che – mustard marinated grilled chicken with garlic mayo, loved the flavour of the garlic mayo, Zucchine Fritte – batter touch sliced zucchini, served with tartar sauce, crispy and yummy! In the mains, we called for the Gnocchi alla Ciociara – gnocchi cooked with chili flakes, bacon, italian sausage, porcini & tomato-cream and the Gnocchi al Gorgonzola – gnocchi tossed in a creamy gorgonzola, both were well prepared and lived up to our expectations. The Toscana pizza was next on our list of mains – basil pesto, mozzarella, chicken, onions & bell peppers on a thin crust base – perfect! The Penne alla Romana pasta prepared in cream sauce with chicken and mushrooms was also worth the try. The other ordered a couple of other mains, but these were our favourites! And when we thought this was all, our round of desserts was served. The Bailey’s Surprise – a sinful and delectable merge of succulent chocolate mousse and baileys, Tiramisu – a delightful combination of soaked sponge in coffee and rum and layered with mascarpone cheese and sabayon. 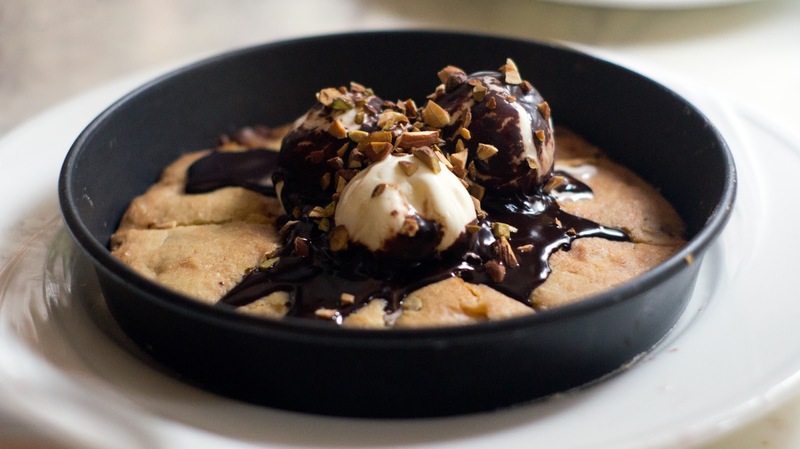 and the Pizookie – freshly baked, hot out of the oven cookie topped with vanilla ice cream, chocolate sauce and nuts. When you are not too hungry, we would suggest, start with the desserts, they cannot be missed! 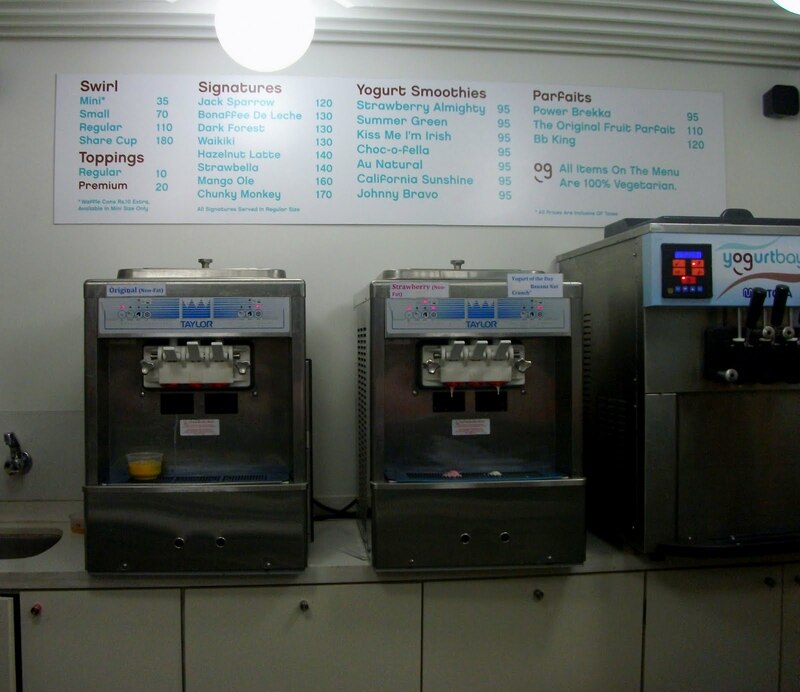 After Cocoberry and Fro Yo, Bandra gets a brand new Frozen Yogurt Place called Yogurtbay. 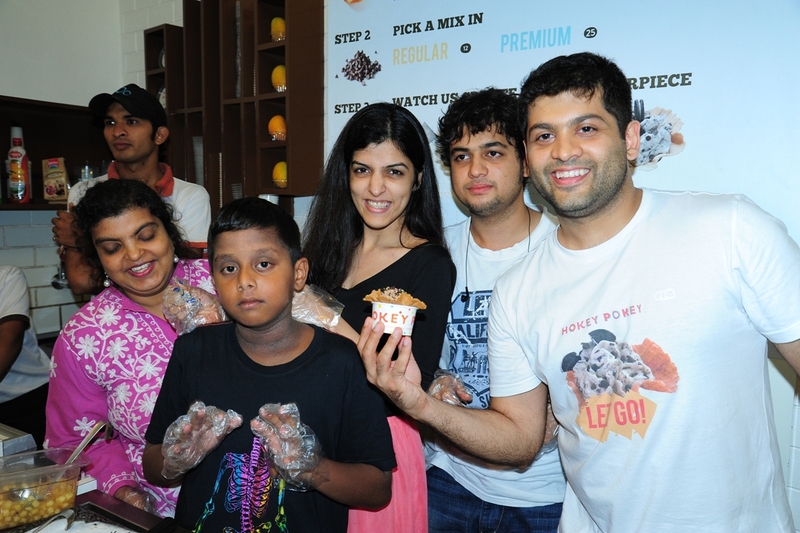 Located in the Khau Galli of Carter Road, the new kid on the block, promoted its launch by giving out free cups of yogurt with lots of toppings on the first day. Impressive, huh? We reached Yogurt Bay after the much created hype and tried the Blueberry Cheesecake Yogurt, the Strawberry Yogurt and the Chocolate Yogurt. The Blueberry Yogurt was sinful, Strawberry was not bad either, but the Chocolate Yogurt tasted like a sorbet (we wouldn’t recommend it). For the toppings, you can choose from the Oreo cookies, Brownies, Marshmallows, Strawberries, Choco chips and lots more. What you must try are the ‘Poppers’, they are small jelly pieces that burst in your mouth, distinctive and exciting! They have played smart when it comes to the seating. Cushions are placed on the platform outside the parlour giving it a young and refreshing look. Great effort we must say, Yogurtbay is definitely here to stay! Swirls range from Rs 35 – Rs 180. Behind Every Dead End, There’s Politics! Read between the lines, Dead Ends are always courtesy some political party or another. And this one just proves our point!